To recap, when questioned about throwing a loaded gun in a trash-can, Bond simply replies, "It's America. I don't have time to give it to a child or a mentally ill person, so I'm leaving it in a bin for them to find." When it comes to critiquing our Nation's policy on guns that is just, well, ouch. It burns because it is uncomfortably accurate about how easy it is for one to get their hands on a lethal weapon and when someone can buy an AR-15 in about seven minutes, the joke is as unfortunate as it is clever. 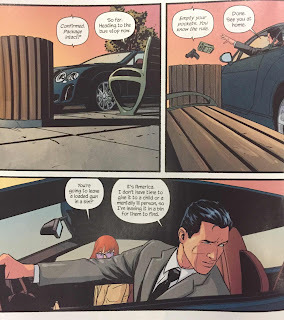 I'm not sure how much of that line is supposed to be coming from James Bond and how much from Warren Ellis, but whatever the case it is hilarious, albeit in a supremely depressing fashion.